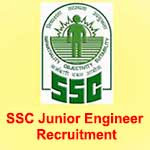 SSC Junior Engineer Recruitment 2017 – Apply Online for Junior Engineer Posts:- Staff Selection Commission (SSC) has issued notification for the recruitment of Junior Engineer (Civil, Electrical, Mechanical, Quantity Surveying and Contract ) in various departments. Interested & eligible candidates can apply online through official website of SSC. Online Application Process has started from 21/10/2017 and the last date for submission of online application is 17/11/2017. Application Fee: Rs.100/ – (Rupees One Hundred only). Women candidates and candidates belonging to Scheduled Caste, and Scheduled Tribes , Physically handicapped and Ex – Servicemen eligible for reservation are exempted from paying fee, as per ru les/instructions of Department of Personnel and Training, Government of India. Commencement of Online Application :21/10/2017. Last Date of Online Registration:17/11/2017. How to Apply: Interested & Eligible Candidates can apply online through http://ssconline.nic.in from 21st Oct 2017 to 17th Nov 2017. Subscribe our Free Job Alert Mail Service for SSC Junior Engineer Recruitment 2017.